Doppler Photo: Photos and stories by Omari Stephens: Crittfest! 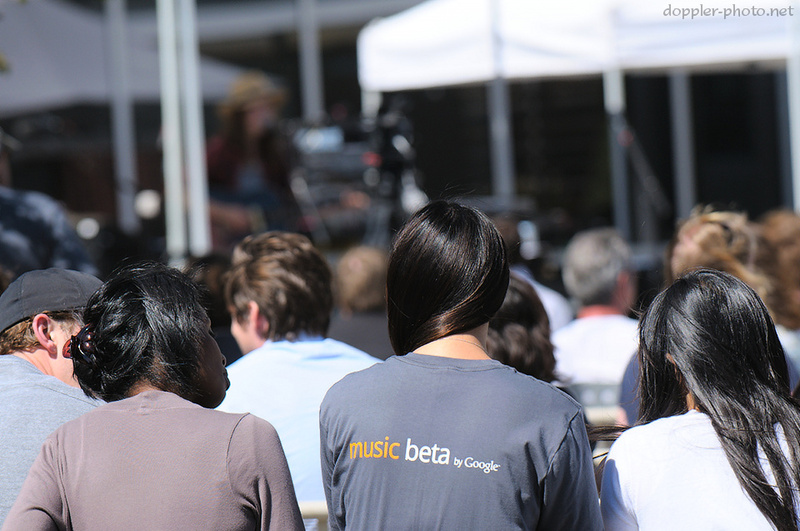 On August 11th, the day before the Outside Lands music festival, we got a triple-header at the Music Beta by Google concert series. 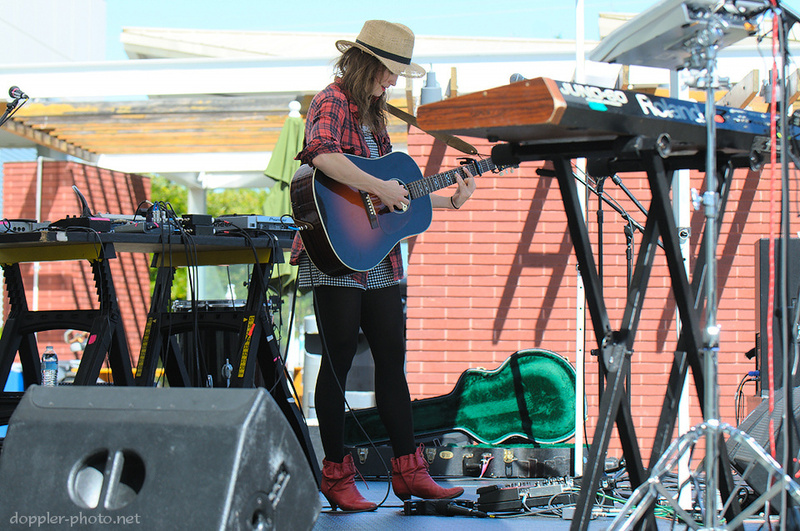 The bands Clap Your Hands Say Yeah and The Limousines, as well as solo singer Dawn Landes all joined us for a sunny afternoon at The Googleplex. 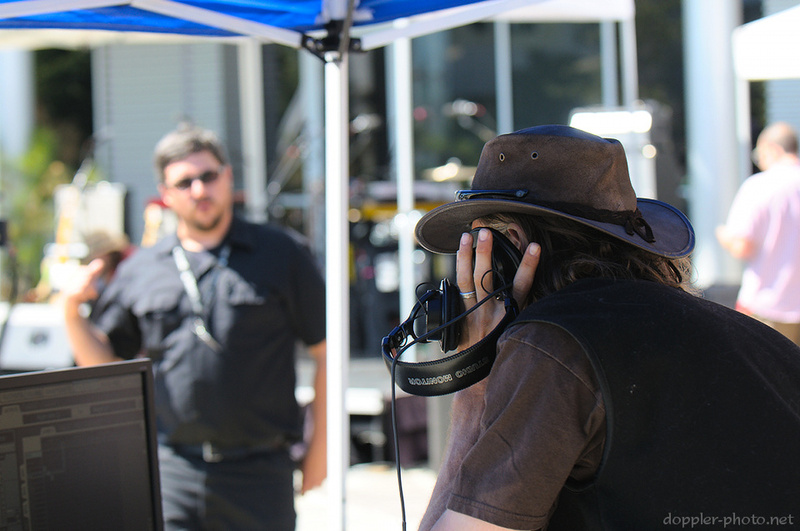 The performances happened at Google's Crittenden campus, which determined the name of the whole affair. Presumably in an effort to minimize the pause between each set, each of the three groups did a sound check before the show got rolling. If that was the plan, it seemed to work, because the transitions during the show looked pretty effortless. During the sound check, a large portion of the audience members waited in lines for free food, drinks, and schwag. 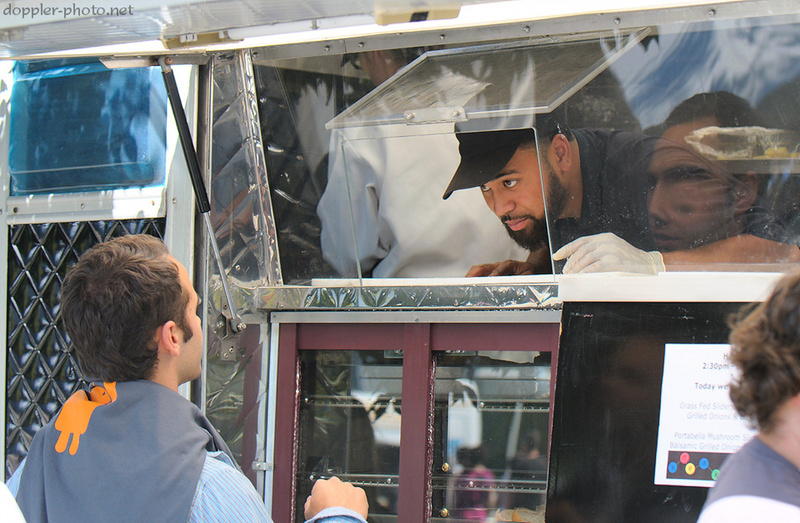 A number of food trucks were in attendance, including Junior Barbecue, Kung Fu Tacos, The Ice Cream Man, as well as Google's own Sneak(/Snack) Attack truck. Above, one of the folks on Sneak Attack serves a customer. The stage was pretty packed with gear by the time Dawn Landes kicked things off. 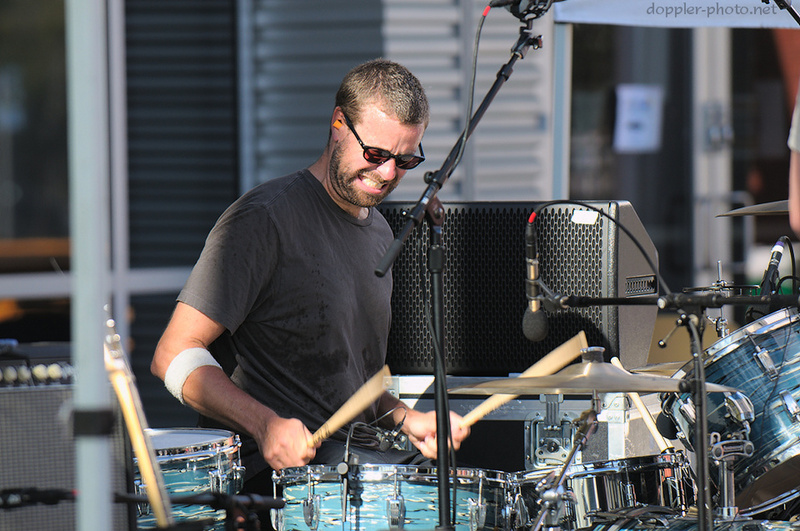 Landes has released a number of solo albums, and is currently playing with The Bandana Splits, a New York-based trio which released its debut album this past month. 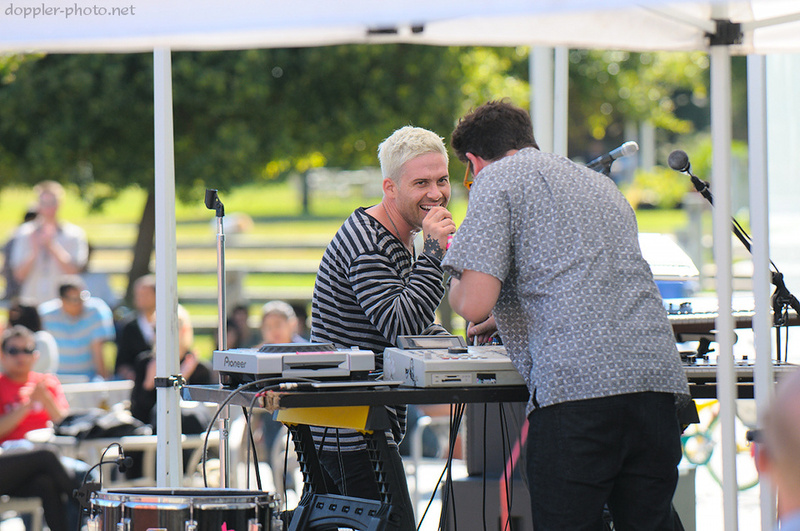 Second on stage were electro-pop duo The Limousines, with Eric Victorino on vocals and Giovanni Giusti playing a variety of electronic instruments including a talk box. During the performance, I was struck by how similar the group sounded to Daft Punk at times. I chatted with Giusti a bit after the show, at which point he mentioned that the group Daft Punk is one of his role models. He further explained that they make extensive use of the talk box as well, which explains a lot of the similarity I had noticed. The headliners were Clap Your Hands Say Yeah, a New-York-based band with five members. The group was on the West Coast for the Outside Lands festival, and is currently on tour in Europe following the release of their new album Hysterical. CYHSY used a decent variety of instruments onstage, and two of the five would switch up from song to song. Frontman/guitarist Alec Ounsworth and bassist Tyler Sargent were pretty consistent, as was drummer Sean Greenhalgh (seen above), who played all manner of percussion. Robbie Guertin and Lee Sargent switched between guitars, keyboards, a toy piano, and percussion as the songs required. 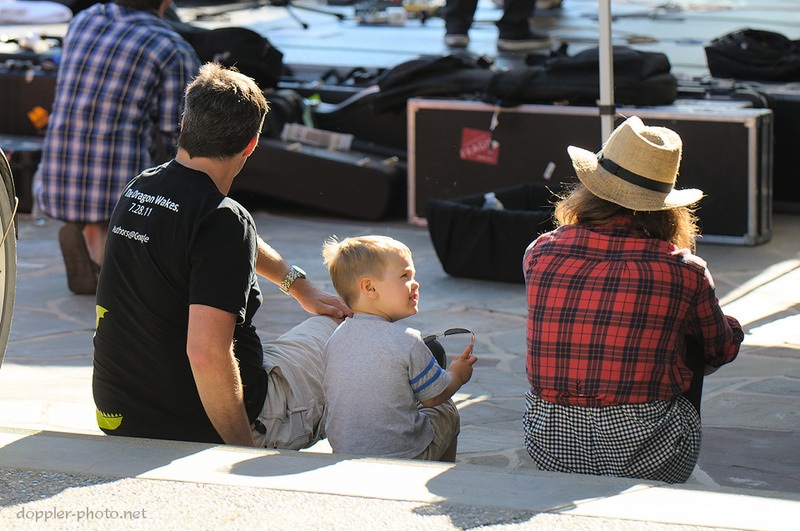 A young member of the audience looks up at Dawn Landes as she listens to the end of the Clap Your Hands Say Yeah set. Ice Cream Man Matt Allen hangs out after the show. I found him to be something of an enigma; thankfully, I had a chance to chat with him over a Vanilla icecream as he waited for the musicians to finish packing up their gear. Put simply, Matt goes places to give people free icecream. He mentioned that one of his motivations is the ability of free icecream to catalyze spontaneous social interactions. Interestingly, ice cream is a perfect food to do that — it's free, so there's always a line; it's just unwieldy enough to keep people from really multitasking while they're eating it, but not so bad as to keep them from talking; and it takes long enough to eat that time arises for those spontaneous interactions to happen. Matt also drives. A lot. He works hard in the service of free icecream. It seems like he follows music and tries to add a little bit of joy. When we spoke after Crittfest, he said that a couple days prior, he was empty (in the icecream sense) and in the middle of the country. He picked up some icecream on the way to Crittfest, and then had to pick up even more icecream before heading to Outside Lands the following day. 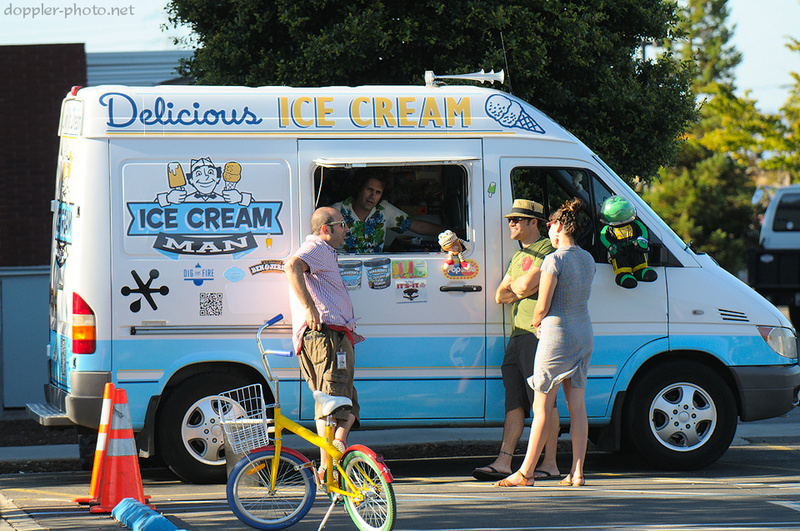 Then during the festival, he did a short video with CYHSY: Summer Jammin' with Ice Cream Man. Well, that's Crittfest. Click here to see the rest of the photos.